Does legal weed make police more effective? Marijuana legalization in Colorado and Washington state has “produced some demonstrable and persistent benefit” to police departments' ability to solve other types of crime, according to researchers at Washington State University. 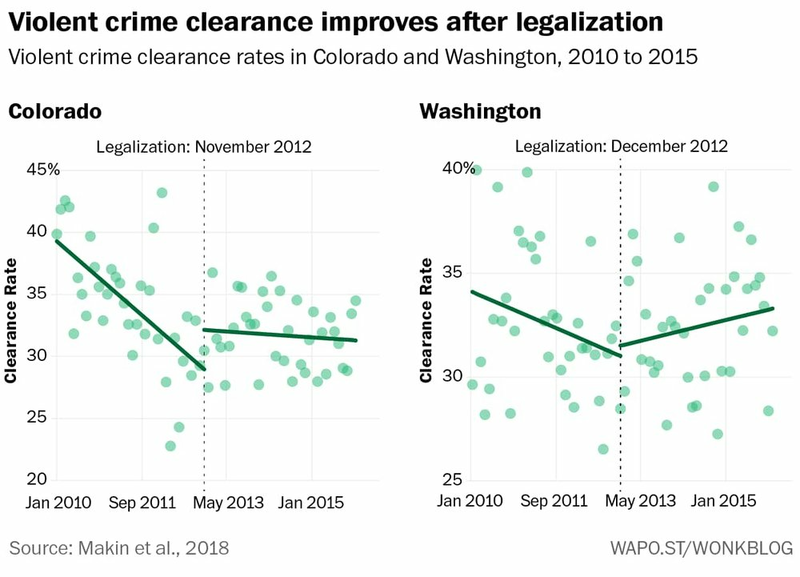 The chart above shows violent crime clearance rates before and after legalization in Colorado in Washington. Clearance rates were falling in both states before legalization. Afterward the decline stabilized in Colorado and began to reverse itself in Washington. The authors note that no similar shift happened in the country as a whole. They note, however, that no other major changes to public policy happened in those states that would affect clearance rates in the way they observed. “We think the argument that legalization did, in fact, produce a measurable impact on clearance rates is plausible,” they conclude.